Recently I have been getting tummy ache due to eating carelessly. After a brief discussion with Sayang, she decided to blog about it pulak. Anyway, no tummy ache is ever gonna stop me from trying out food. But to be honest, I did chicken out from trying out the Bakso when in Bali. The Bakso really looked too dirty to try la. Recently, during the Fasting month, I remember avoiding stalls which specifically had too many flys hovering around the food. Just in case la... although those food looked mouthwateringly delicious. Scared also leh. 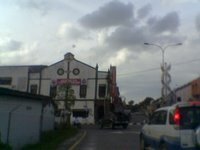 Anyway as a follow up to the previous post about Siti's house, I decided to go back to the place, which is very near the center of Lipis town and snap this photo. The picture speaks for itself, wakakakaka. I mean this place really has nothing to do. I tried getting lost today, and I found myself back in town somewhere in Lipis. Yikes, its so small, want to get lost also difficult. Ratha Curry House , Raub. 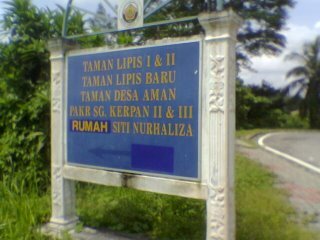 So last Saturday, on the way back home from Lipis, we decided to stop by Raub. I wanted to try this place called Ratha Curry House, the Famous Fish Head Curry House. I always wondered, how good can you be , since you are famous. Famous for what in the first place ? This place got a good location too. The first thing you see as you enter Raub old Town, is Ratha's Curry House. So I stepped in, the first impression is a standard Indian restaurant. Quite normal la, with lots of Chinese people in it. The establishment was quite clean also, with fully tiled floor and also fully tiled walls with plaster ceiling and downlights. Generally, a bit nicer than a normal Mamak stall but not as nice as the Pelita Restaurants or Kayu restaurant we find in town. The difference is that, they have a pic of the Sultan of Pahang dining in this place. Also got a pic of Tun Ghafar Baba also ada. So because of this they famous la , kot. So I sat myself down, looked at the menu, ordered a Thosai Masala and Nescafe Ais. The Thosai came in about 10 minutes, quite fast la, the Nescafe was normal, actual it was quite watered down. It came with Dhal and Fish Curry and as you can see on the right most, I asked for Vege. Hmm, I thought Thosai always come with that Orange and White coconut thingy. Anyway, this is how it came to me. 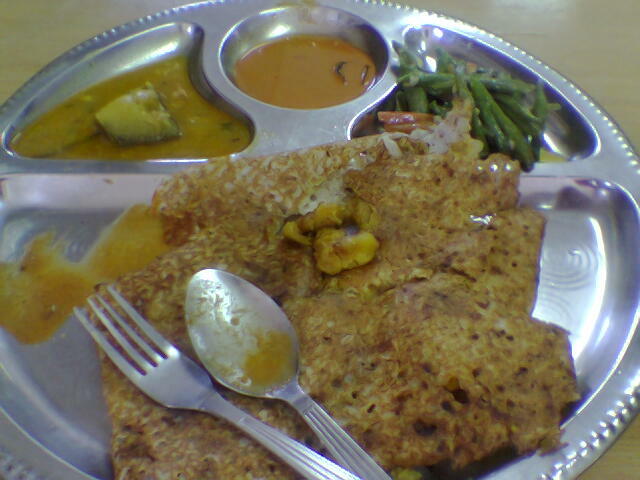 The Thosai was nice, quite garing, it tasted sour enough but not too sour, just nice. My complain would be, the Dhal and Curry both came cold. Like they had no money to keep their dhal and curry warm. Sad. I don think I will come back anytime soon. Oh ya, they have a branch in Goh Tong Jaya, so next time anyone travels to da Gentings, you all can go try trys this famous curry Fish Head la. Kampung Pandan mamak also claim their Curry Fish Head Veli famous wan, but frankly they are just not done nicely, Either the fish too big or it is over cooked. Wanna eat fish head ? stay with Chinese style wan.